I had to fast over night and skip Breakfast this morning. I had my 4 month checkup at the Family Doctor for my for my cholesterol, sugar and etc. Really great timing to have to have this done. Fasting on Christmas Night with everything to eat and snack on. This will be the last time I let them schedule this around a Holiday! Anyway I had to be at the Doctor at 8:15. It’s one COLD morning out there today! A low of 14 degrees and a high of only 24 along with one cold breeze. I guess our mild Winter is over. Back home gave Mom a hand with a couple of loads of laundry. Then after Lunch I cleaned the house, vacuum and dusted. For Dinner tonight it’s Christmas Dinner leftovers! 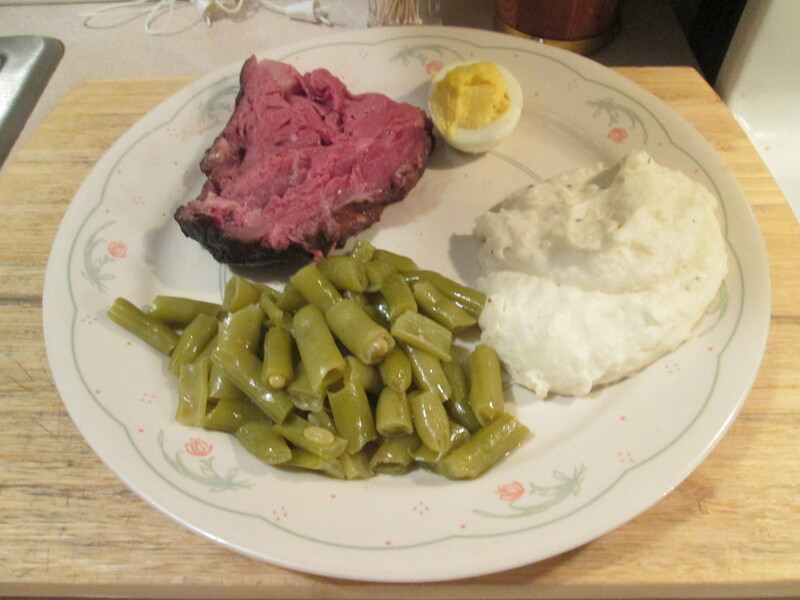 I reheated the Prime Rib w/ Mashed Potatoes and Green Beans. Then I also baked a loaf of Pillsbury French Bread. Then to reheat the Prime Rib I heated the oven on 350 degrees. Sliced off my Prime Rib from the remaining Roast and put the slice into a small baking pan. Covered the pan with Foil and reheated it for about 15 minutes. It reheated perfectly, and tasted just as delicious! You got to leftovers especially when its Prime Ribs and Sides! As I said I also baked a loaf of Pillsbury French Bread. For Dessert/Snack tonight I had a bowl of Skinny Pop – Pop Corn along with a Diet Dr. Pepper to drink. It is most often roasted “standing” on the rib bones so that the meat does not touch the pan. An alternative cut removes the top end of the ribs for easier carving. Rib eye steaks are cut from a standing rib, boned with most of the fat and lesser muscles removed. 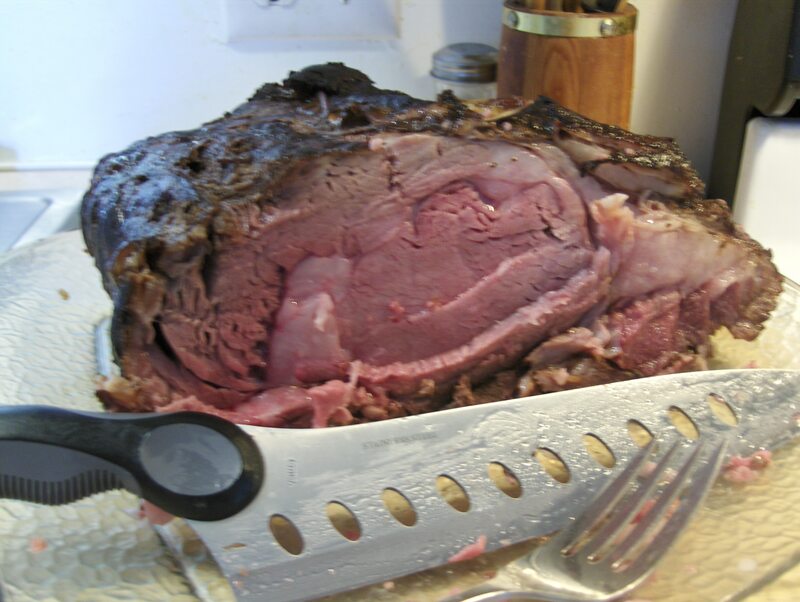 While often referred to as “prime rib”, the USDA does not require the cut to be derived from USDA Prime grade beef. For Breakfast on this Easter Morning I toasted a Healthy Life Whole Grain English Muffin, Scrambled 1 Egg, and a cup of Bigelow Decaf Green Tea. Not much going on today. Mom went on to Church early, she was meeting some friends for Breakfast. I stayed home and did a load of laundry and cleaned the house. Cloudy this morning and rain moved in by the afternoon. Went over to see Dad for a while and back home to fix an Easter Dinner for me and Mom. I prepared a Prime Rib w/ Savory Herb Potatoes, Cut Green Beans, and Whole Baby Carrots. We had a Prime Rib Roast in the freezer that I had purchased at Mejier. I like Prime Rib but it’s so overpriced. This was one that weighed just over 3 lbs., 3.7 lbs. Just the right size for myself and Mom. I preheated the oven on 325 degrees. I took a small roaster pan and sprayed it Pam Cooking Spray and I rubbed a light coat of Extra light Olive Oil on it. Once the oven was heated I put the Roast in the pan and baked it for about 75 minutes. I took the pan out and checked the internal temperature with my meat thermometer and it was right where we wanted at 121 degrees. I let the Roast sit for 10 minutes before slicing it. The Roast was cooked to a perfect Medium Rare. The Roast came moist and juicy! Cutting in to it was very tender and has an excellent taste. We’ll definitely purchase this again from Meijer! Mom loves having multiple side dishes with meals so I prepared a good variety. For one side I prepared some Little Potato Company Savory Herb Potatoes. Then I prepared a can of Del Monte Cut Green Beans. Then I opened up a can of Kroger Brand Whole Baby Carrots. I also baked some of Mom’s favorite Rolls, Hawaiian Rolls. For my Dessert later a Breyer’s 100 Calorie Cup of Vanilla Ice Cream. Hope everyone had a great Easter! For Breakfast on this Christmas Morning I toasted a Healthy Life Whole Grain English Muffin and added a few slices of Boar’s Head Sweet Slice Ham, for a light Breakfast Sandwich. After we were done with Breakfast we opened gifts and afterwards mad a few phone calls to friends and relatives wishing them a Merry Christmas! For our Christmas Dinner we are having Prime Rib w/ Savory Herb Potatoes, Cut Green Beans, and Whole Baby Carrots. We couldn’t decide on what to have for Christmas Dinner. While I was at Meijer a few days ago I seen they had some small Prime Ribs so I grabbed one of those. I like Prime Rib but it’s so overpriced. This was one that weighed just over 3 lbs., 3.11 lbs. Just the right size for myself and Mom and Dad. As most Prime Rib Roasts it was very easy to prepare. Mom and Dad love multiple side dishes with their meals so i gave them a good variety. For one side I prepared some Little Potato Company Savory Herb Potatoes. Then I prepared a can of Del Monte Cut Green Beans. Then I opened up a can of Kroger Brand Whole Baby Carrots. I also baked some of Mom and Dad’s favorite Rolls, Hawaiian Rolls. For my Dessert later a Breyer’s 100 Calorie Cup of Chocolate Ice Cream. What a beautiful morning, sunny and 60 degrees with no humidity! I mean a perfect morning. Got the cart out early this morning and was on and off of it all day, enjoying this weather. Repaired an eave spout in the back of the house and straightened up the shed a bit. For dinner tonight it was leftovers, some delicious leftovers! I prepared a Baked (Leftover) Pot Roast Mini Sub w/ Red Potatoes and Mini Carrots. The Pot Roast Beef (Beef Shoulder) was so delicious last night for dinner, I didn’t want to waste any of the leftovers. I took the Pot Roast and shredded it up a bit, discarding what little fat from it. Using a Crock Pot to prepare any meat, in most cases will get rid of most of the fat and turn it to flavor. I took the Shredded Beef and layered it on a Meijer Bakery Perfection Deli Mini Wheat Sub Bun. Topped it with just a bit of Sweet Hot Stone Ground Mustard and a slice of Boar’s Head Muenster Cheese. I used I Can’t Believe It’s Not Butter and buttered the top Bun, so when I bake it will be nice and toasty. Put it on a small cookie sheet and baked for about 8 minutes at 400 degrees. 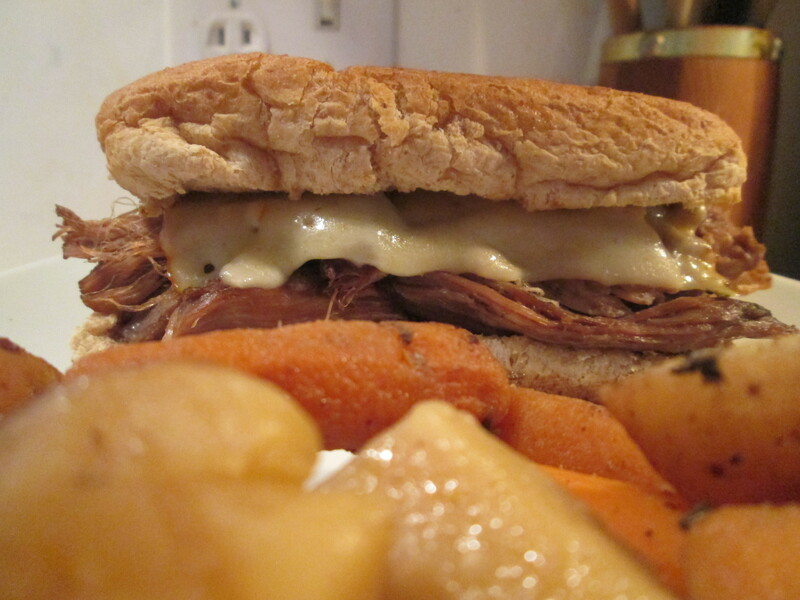 Yesterday’s pot Roast has made one delicious Mini Sub! The Beef moist and delicious, the melted Cheese over top, Sweet Mustard, and the crusty Bun, it all combines for one great Sandwich! Then for a side I reheated some of the Red Potatoes and Baby Carrots. For dessert later a bowl of Breyer’s Carb Smart Vanilla Bean Ice Cream. Let me start by saying “Merry Christmas” to everyone! In the past we always had a huge family gathering for Christmas Dinner but the today as the last couple of Christmas Dinner it’s just been Mom and Dad and myself. It’s been a quiet relaxing Christmas. Another cold one out but not as bad as yesterday, no wind today made the difference. For dinner it was a feast! I prepared a Prime Rib w/ Mashed Potatoes, Green Beans, and Baked Cheddar Bay Biscuits. I had purchased a Seasoned Half Beef Ribeye for Prime Rib Roast at a local GFS Market in nearby Fairfield a while back and had it in the freezer. Laid it out in the fridge yesterday to thaw so it was ready for the oven today. Nice size one, 7.750 lbs. of nothing but Prime Rib! So easy to prepare, just preheated the oven at 250 degrees. Then placed the roast in a medium size roasting pan with a rack in it. Sprayed the rack with Pam Spray and added a 1/4″ of water to the pan. Then placed the Roast on the rack and basted it in its own juices that were in the bag. Placed it in the oven for about 2 1/2 hours, til a thermometer read 120 degrees, perfect medium rare! As it was roasting I would baste it from time to time with the juice. We buy our Prime Rib from GFS every year and the quality is always spot on. Tender, moist, and just bursting with flavor! This one was so tender you could cut it with your fork. Plus always the good thing, lots of leftovers for some incredible Prime Rib Sandwiches! 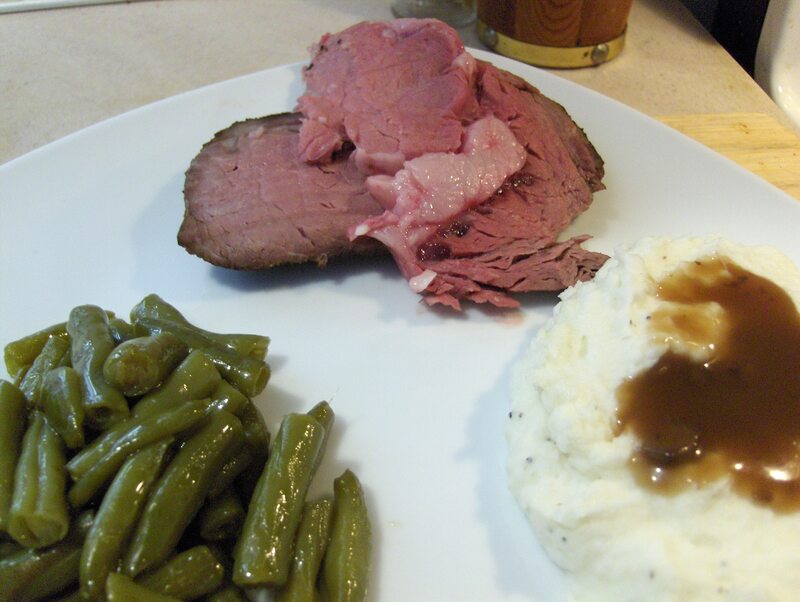 Prime Rib as far as I’m concerned is a meal in its self but Mom and Dad love the side dishes. So for one side I heated up our favorite Mashed Potatoes, Bob Evan’s Mashed Potatoes. These are so good and saves so much time than having to peel, cook and mashed potatoes! Then I also heated a jar of the Canned Green Beans we had Canned earlier this year. Nothing like fresh Green Beans in the Winter! As if that’s not enough my dad wanted some Corn on the Cob so I boiled some Mini Ears of Green Giant Mini Ears of Sweet Corn. I used the juice of the Prime Rib when it was done for some Gravy and I baked some Red Lobster Cheddar Bay Biscuits. First time I had baked this one. Just mixed the Packet of Biscuit with water and grated Cheddar Cheese. Mixed it into a dough and made it into balls on to a baking sheet. Baked at 425 degrees for 16 minutes. When ready I basted them with a Garlic Butter Sauce while they were still hot. Tasted just like what you get at the Red Lobster! For dessert later a Skinny Cow Chocolate Truffle Ice Cream Bar. Prime Rib w/ Mashed Potatoes, Brown Mushroom Gravy, Green Beans, and..
First off Merry Christmas Everyone! Now let’s talk about our Christmas Dinner Feast. 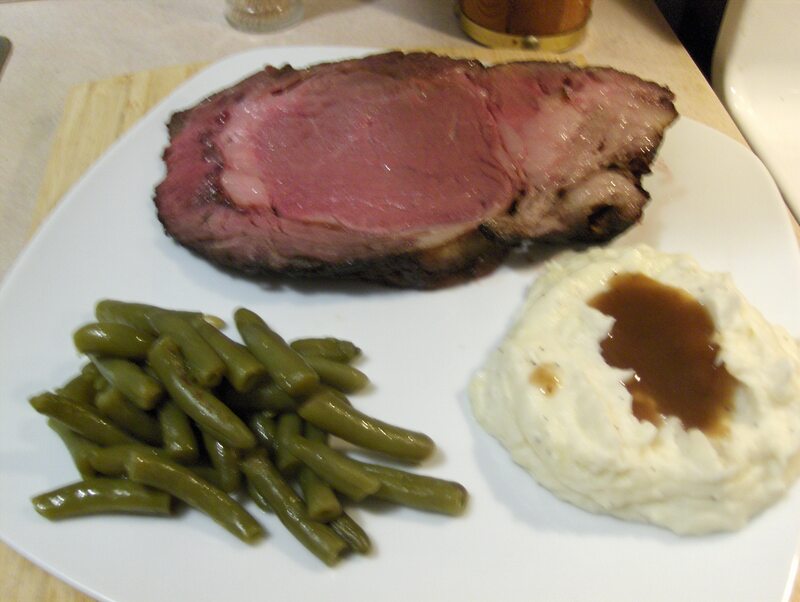 I prepared a Prime Rib w/ Mashed Potatoes, Brown Mushroom Gravy, Green Beans, and Baked Rustic French Bread. 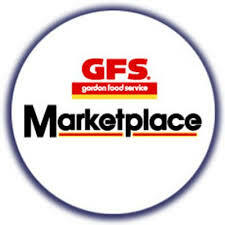 We purchased our annual Christmas Prime Rib Roast a couple a weeks ago from the local GFS Store. We always purchase one there and have never had a bad one. I put the Prime Rib in the oven at 1:30 PM at 250 degrees. At 3:30 I checked the temperature and it was spot on at 120 degrees, rare. I pulled it out of the oven and let it sit for 15 minutes before slicing. Letting it sit lets it finish cooking and absorb some of the delicious juices. When I sliced it the juices just flowed! Moist, tender and delicious! For sides I prepared Bob Evans Mashed potatoes, Heinz Savory Mushroom Brown Gravy, 2 large cans of Del Monte Low Sodium Cut Green Beans, and baked a loaf of Pillsbury Rustic French Bread. For dessert later a bowl of Breyer’s Carb Smart Vanilla Ice Cream topped with Del Monte No Sugar Added Sliced Peaches. Happy Easter everyone! I hope yours was relaxing and delicious as ours was. We had a Prime Rib Roast that was slowed roasted at 250 degrees until the roast read 120 degrees. It came out tender and delicious! The ends were about medium rare while the middle was rare. We used the used the juices and tidbits at the bottom of the roasting pan to pour back over meat after we sliced it making just that more juicy. Plenty of leftovers too which will make some primo prime rib sandwiches! For sides we had Bob Evans Mashed Potatoes that we topped with some Heinz Mushroom Brown Gravy. We also had Green Beans and baked a loaf of Pillsbury Rustic French Bread. For dessert later a Jello Sugar Free Chocolate Pudding topped with Cool Whip Free. Happy Easter all! Well dinner tonight are the leftovers from our Christmas Dinner. Prime Rib w/ Mashed Potatoes & Brown Mushroom Gravy, Green Beans, and Rustic French Bread. I had slow baked the Prime Rib at 250 degrees for three hours, until it was a beautiful medium rare. It came out a just melt in your mouth piece of Prime Rib. I made several sides so everyone had a choice. I made Mashed Potatoes & Brown Mushroom Gravy (Heinz Gravy), Scalloped Potatoes, Green Beans, Baked Glazed Carrots, Rustic French Bread or Healthy Life Whole Grain Bread. For dessert a choice of Pillsbury Nut Quick Bread or my Mom made a Apple Cake. I got up early this morning and made Breakfast for everyone. I made a big skillet of Hash Browns and I then took some of the leftover Prime Rib and warmed it up. I scrambled one Egg for each Sandwich seasoning it with McCormick Grinder Sea Salt and Black Peppercorn. 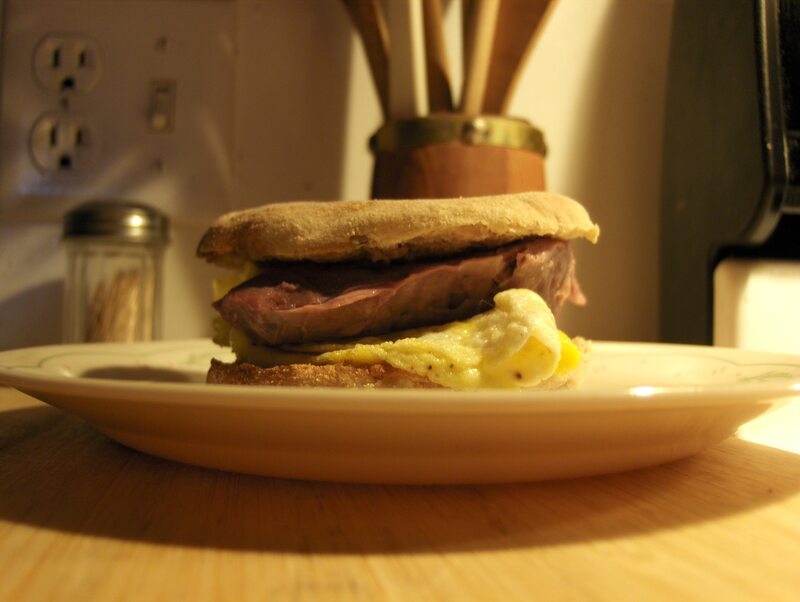 I folded the Egg and and served it on an Healthy Life Whiole Grain English Muffin and added thin slices of Prime Rib with a dab of Woeber’s Horse Radish Mustard. A great light Breakfast to start a beautiful day!